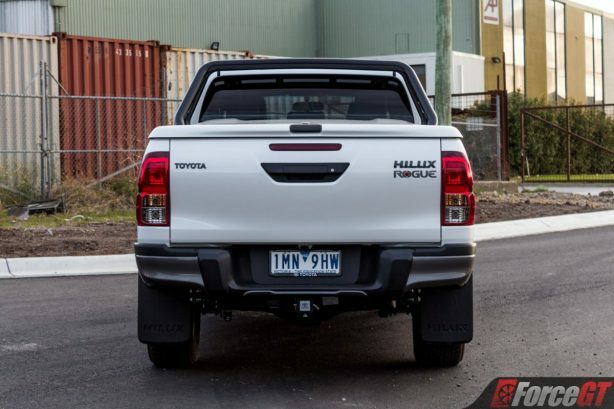 Making sense of the Toyota Hilux range used to be as simple as getting wet at the beach. 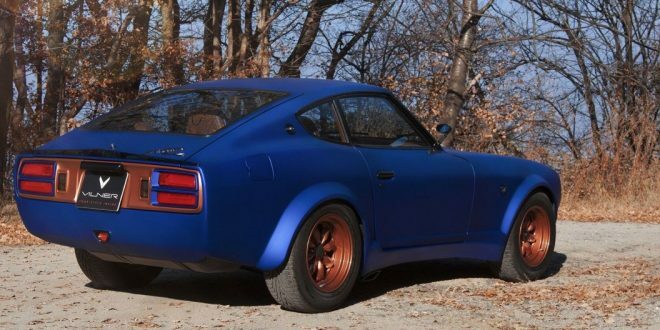 You had the affordable and frugal Workmate, the mid range SR and the top of the line SR5. 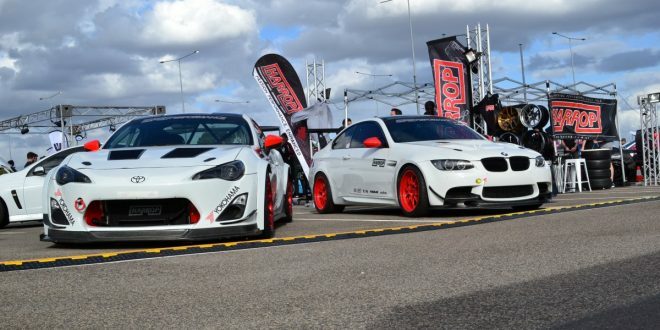 However now there’s twice as many to choose from with three additional grades fleshing out the top end of the line-up. 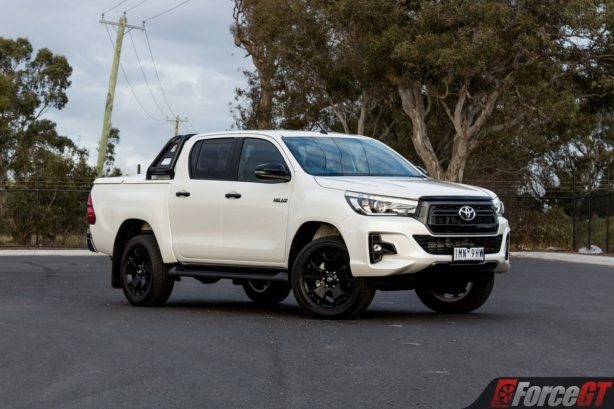 We got given the keys to a Hilux Rogue which will leave a dent in your wallet to the tune of $61,690 leaving us with one big question, who is this premium 4×4 dual cab ute aimed at? At first glance I was surprised that Toyota loaned us the Rogue in white, the colour most closely associated with their lowest spec Workmate range. However after getting up close it was clear that we scored ourselves one finished in Crystal Pearl which looks brilliant when the sunlight reflects off the panel work on those rare moments that it’s kept clean. 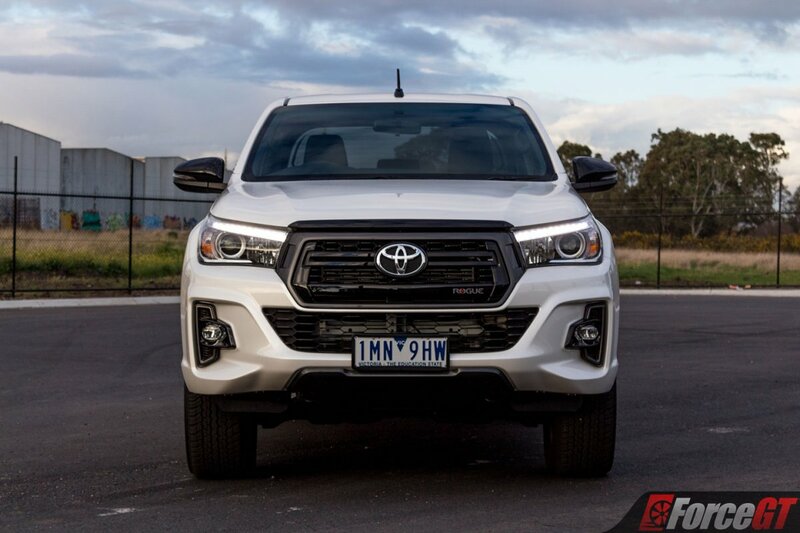 In Rogue spec the Hilux also scores the Melbourne designed front fascia and grille that has been such a big hit that Toyota saw fit to bring it over to both the SR and SR5 models. 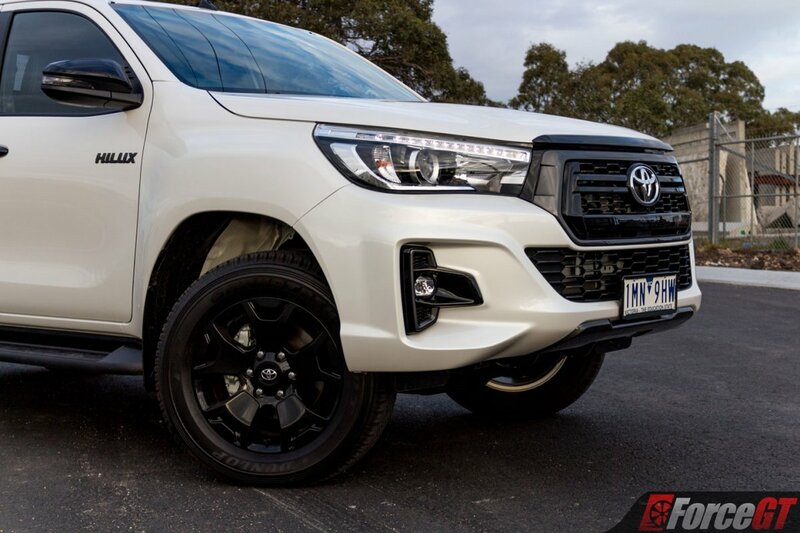 Exclusive to the Hilux Rogue are the black five spoke 18-inch alloys, gloss black mirror caps and door handles, body coloured hard tonneau cover and dark grey Hilux badging with Rogue decals. LED daytime running lights are fitted as standard to the Rogue along with the auto-levelling LED headlights. 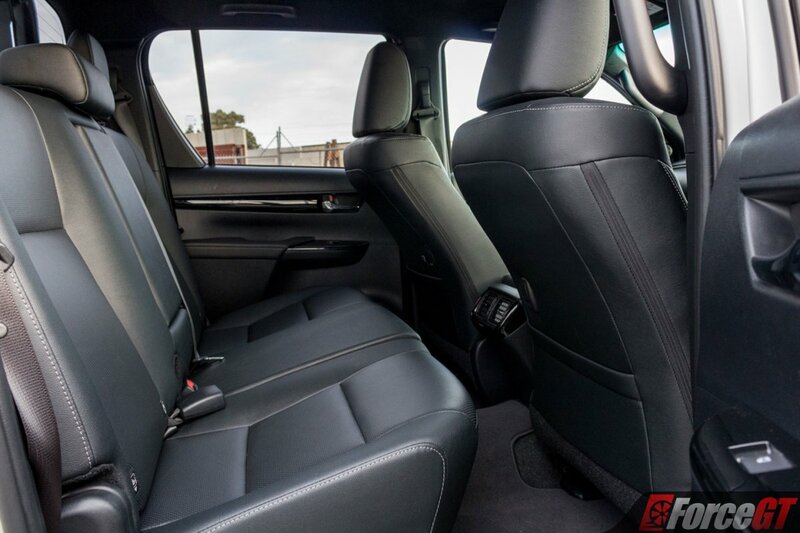 Supporting the premium feel the Rogue features perforated leather front seats with regular leather used for the rear seats, steering wheel, shifter and arm rests. 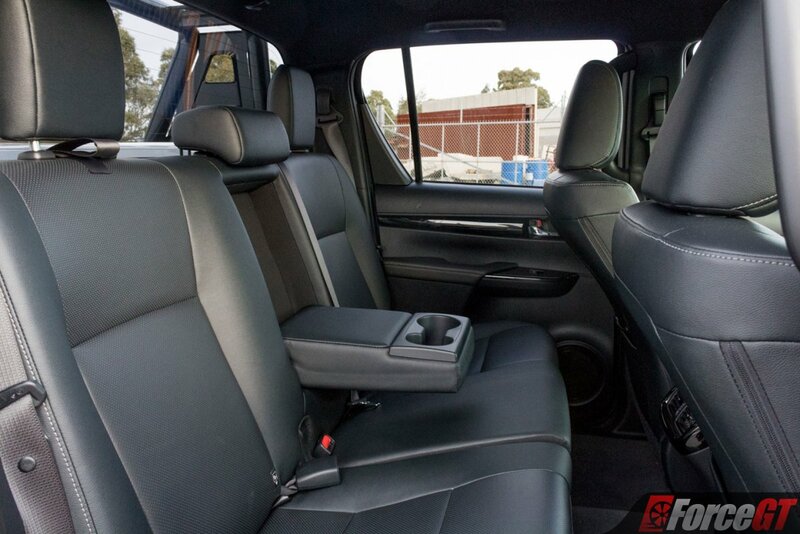 Those front seats are also heated and the driver’s has eight way power adjustability. 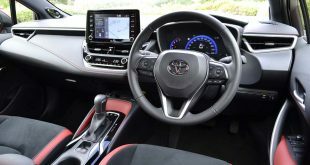 The telescopic steering column is a welcome addition not often found in many rivals providing the Hilux Rogue with an adaptable driving position to maximise comfort. Those in the back are well taken care of in regards to room, I had no problems with leg, head or shoulder space back there. 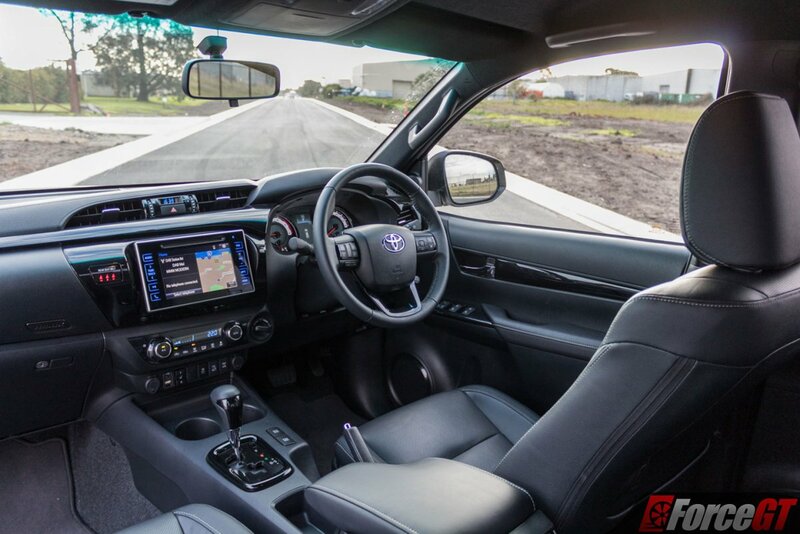 Centre console mounted aircon vents tie in with the single zone climate control to keep the temperature and cranky kids in check. Young families can also rest assured that their children and seats will be securely held in place thanks to two sets of ISOFIX mounting points. 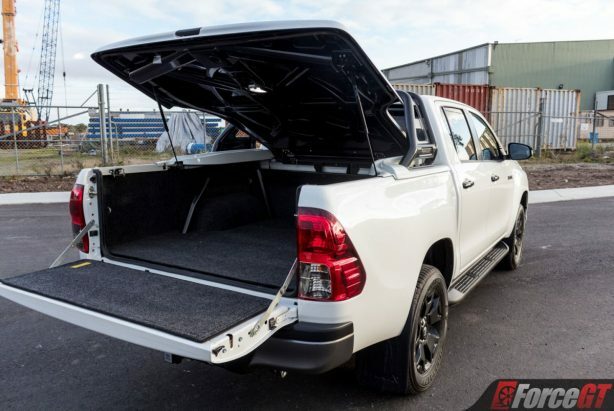 Opening up the tonneau cover is a piece of cake as its lock is connected to the central locking system and once opened up reveals the marine grade carpet lined tub. 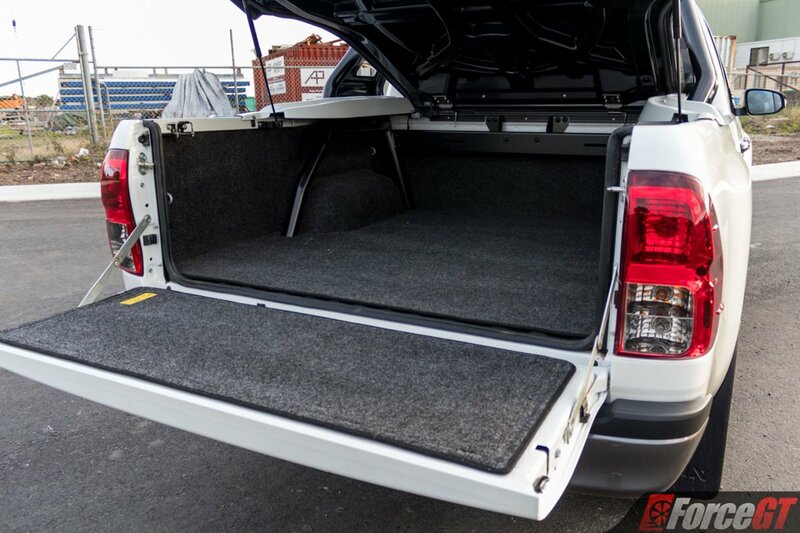 The carpet is held in place with velcro making it easily removable and there’s 4 tie-down points along with the sports bar to keep your heavy bits where you left them. In Rogue spec the Hilux comes standard with a towbar, towball and tongue as well as a 7-pin trailer wiring harness making it ready to haul right out of the dealership. 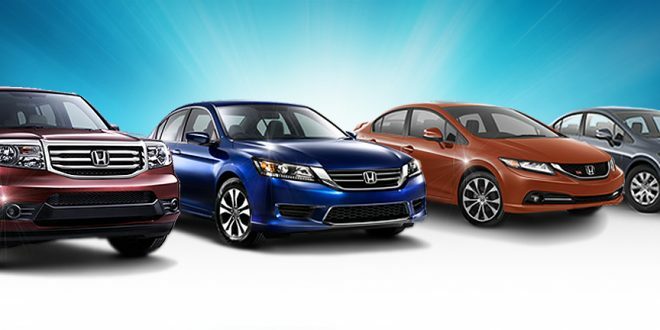 While in the drivers seat where the majority of your time will be spent there were a few minor issues that need to be addressed. First up is the digital radio antenna location, its on the driver’s side of the window which isn’t ideal and can be irritating. 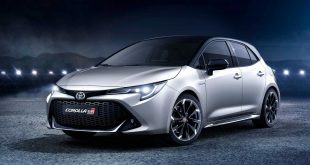 The steering wheel features buttons for almost everything except the instrument cluster’s multi-function display, that’s still operated by the instrument cluster stalk requiring you to get your hands behind the wheel to flip through the settings. 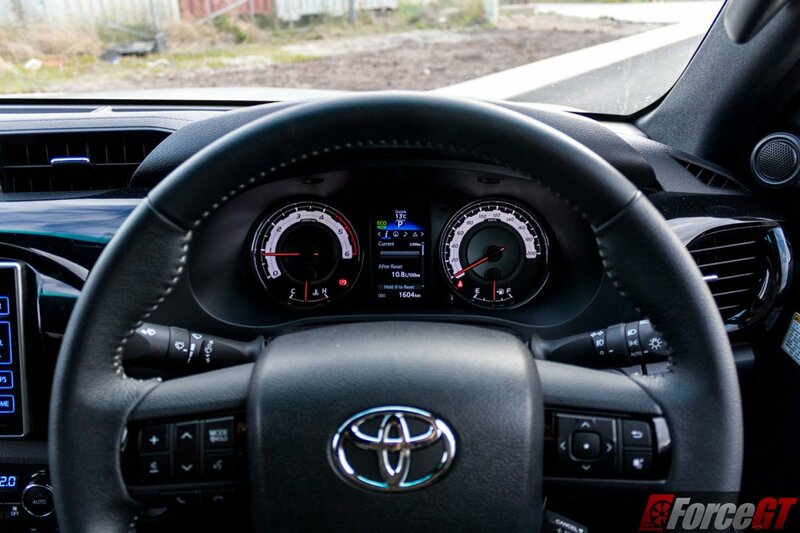 That said the instrument cluster has a fancy looking set of gauges and the trip display shows all the important information at a glance, everything except a digital speed readout which is sorely missing. Visibility is pretty much on par for any other 4×4 ute. To help things out Toyota has fitted the Hilux Rogue with a reversing camera and the large mirrors take the guesswork out of switching lanes though blind spot monitoring would be ideal. There’s some clever storage going on in the Hilux Rogue’s cabin, two gloveboxes are present with one being chilled and the pop out drink holders also feature a small storage tray beneath them that’s mostly hidden. 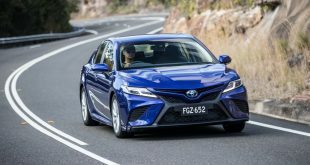 Naturally the quality is to Toyota’s usual high standard but they’ve raised the bar on tactile feel of the door switches which would feel right at home on a Lexus. 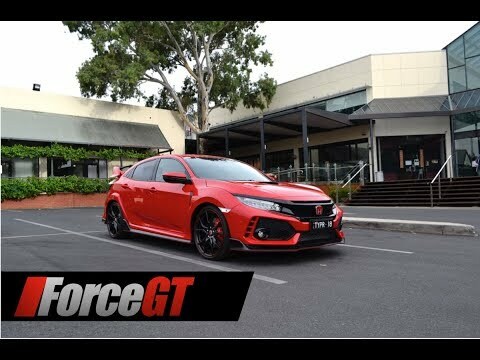 In a straight line you won’t be giving your internal organs a thrashing as the 2.8-litre turbo intercooled four-cylinder diesel musters up a maximum of 130kW @ 3,400rpm. It’s enough to get moving with traffic and not once did it feel underpowered. 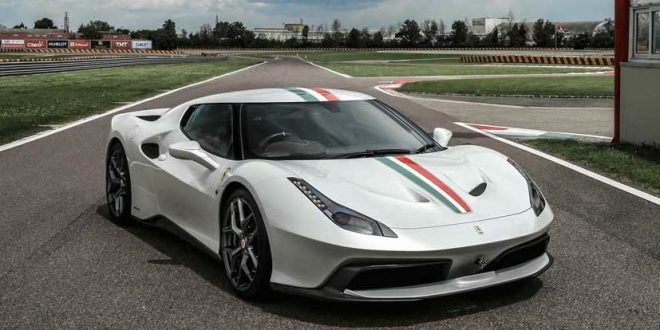 Moving the 2,174kg body is a heavy task for the engine but it’s backed up by the hefty slab of torque measuring up at 450Nm peaking between 1,600rpm and 2,400rpm. 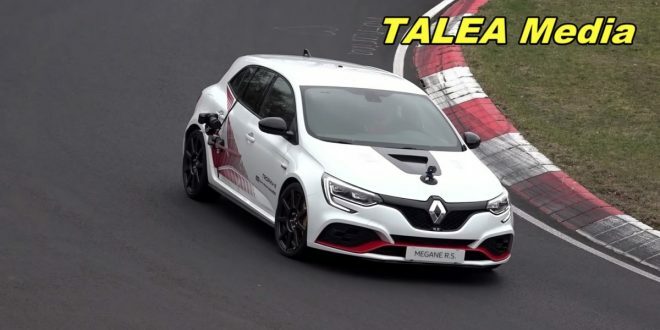 You can do a lot with that sort of torque, like towing a total of 3,200kg for a brake assisted load and 750kg without. 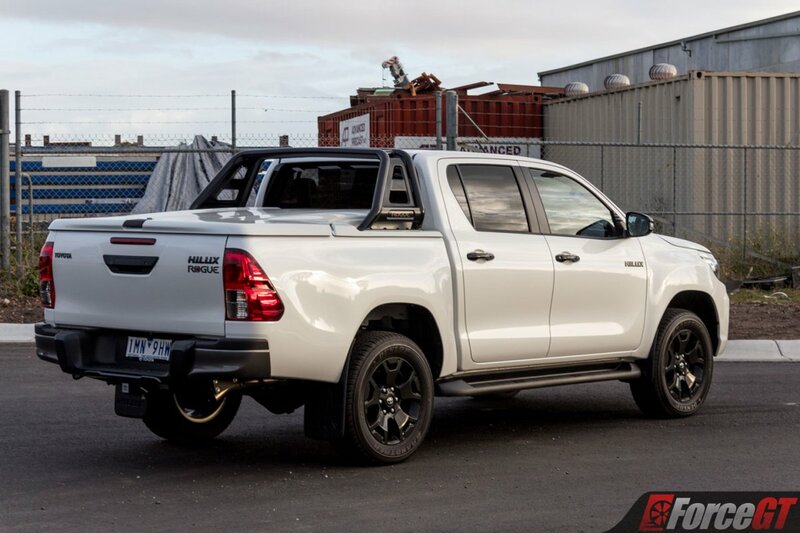 Even with no trailer the rear cargo tub is rated to handle a payload of 826kg. 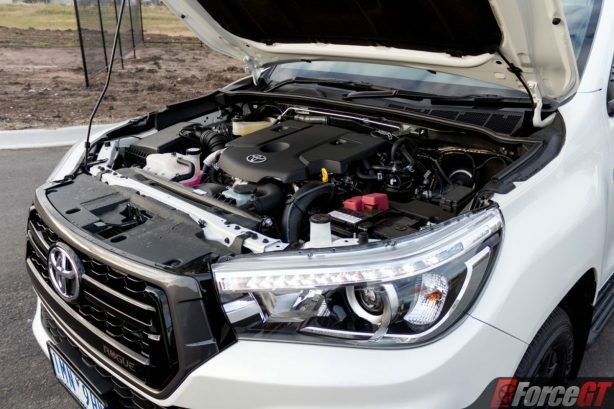 Toyota has made efforts to improve the Hilux’s fuel economy dropping the official figure to 8.5L/100km, though the best I managed was a still respectable 10.8L/100km. 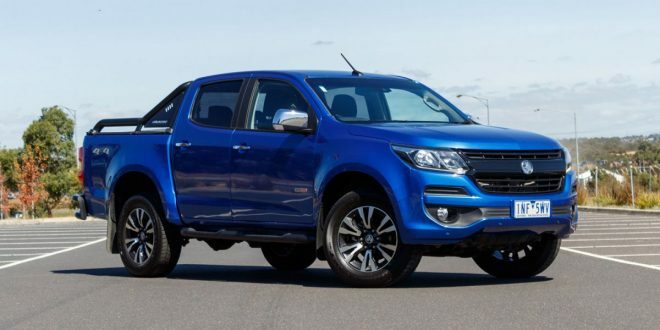 With an 80-litre tank to fill up the Hilux can cover some solid ground before refueling and then going on to drain your wallet. 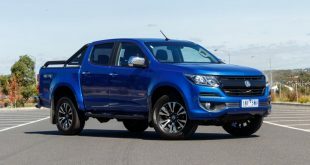 Overall grip levels in the Hilux Rogue on tarmac aren’t as high as expected, two tonnes of body and offroad capable tyres no doubt the cause. 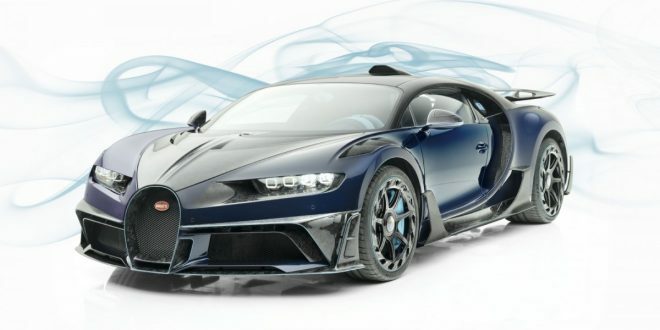 Even when there is enough grip to take a corner at speed the ample body roll will quickly remind you that this thing is offroad orientated in suspension setup. 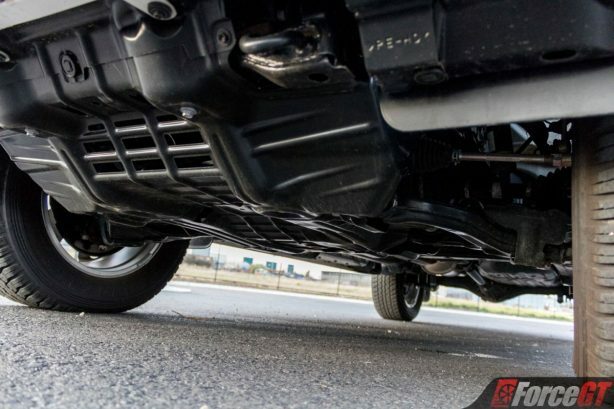 There’s some jiggling over small bumps when unloaded however larger bumps are handled with ease, the Hilux Rogue’s suspension travel all but erasing them from existence for you. 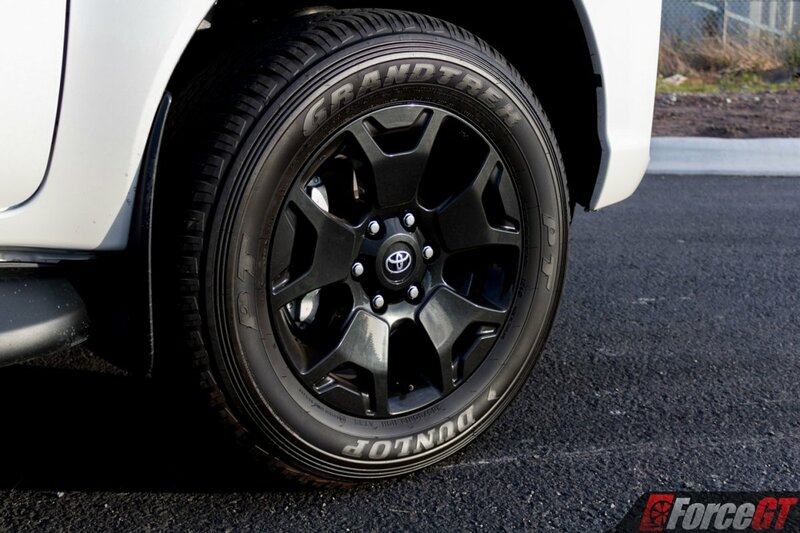 Gravel roads leave you with a great sense of confidence and control while wheel feedback remains adequate to get a feel for what’s happening where the rubber meets the rough stuff. 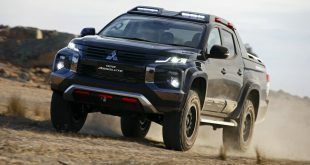 Protective side bars and an engine and transmission bash plate work in tandem with the heavy duty suspension to make the Hilux Rogue both a durable and capable offroad machine that can take serious punishment. 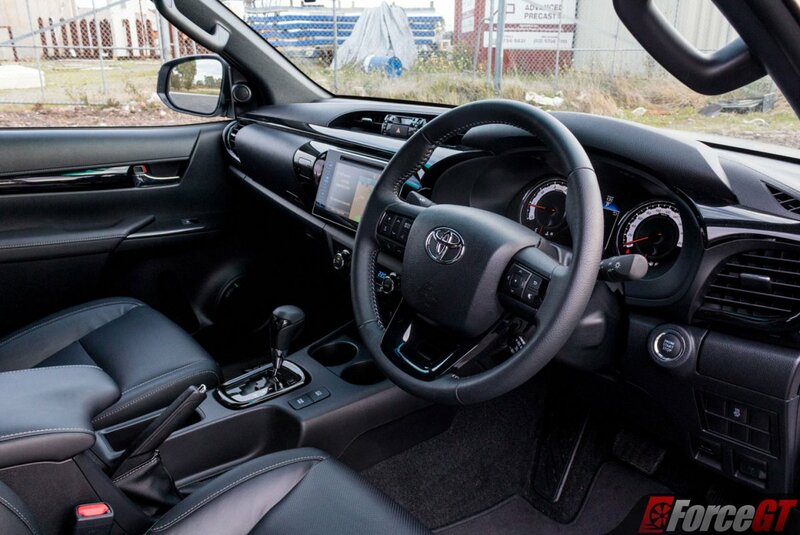 As one of the three top-spec models the Hilux Rogue packs premium features like the power adjustable drivers seat, heated seats and plush leather interior. 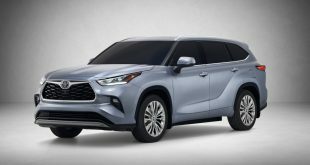 Entertainment is left to the 7-inch touchscreen display with the usual assortment of USB/Aux/Bluetooth though no Android Auto or Apple CarPlay. 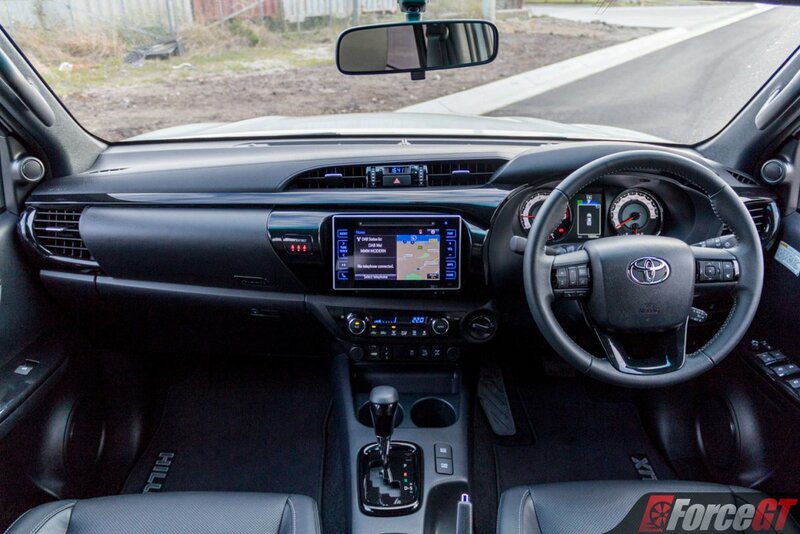 For navigation purposes you’ll have to rely on the built in satellite navigation and Toyota’s Link system. 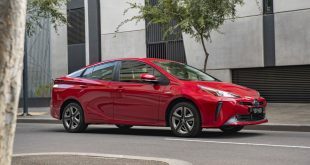 Audio from the 6 speakers is better than average and can be cranked up loud without distortion letting you make the most of the DAB+ digital radio equipped infotainment system. The system performed well until I connected my phone via Bluetooth at which point switching tracks became unresponsive and there were buffering issues which was a big disappointment. 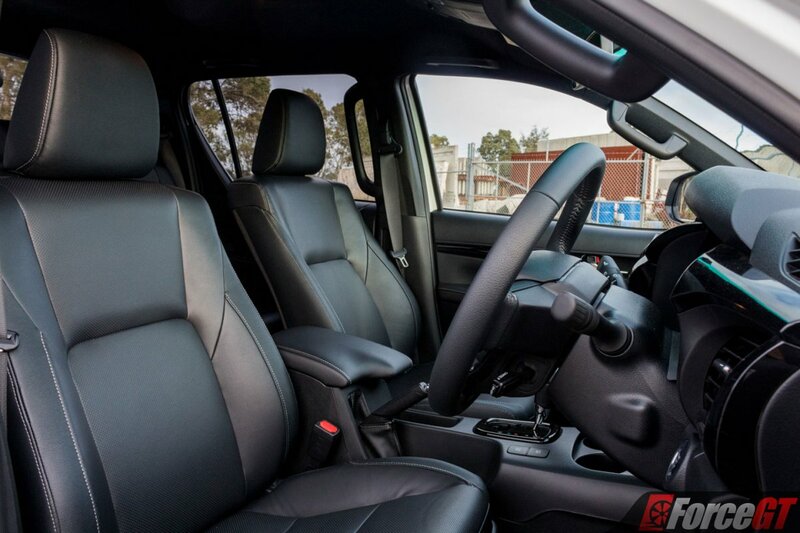 There’s no lacking in the safety department for the Hilux with a solid 7 airbags throughout the cabin. Hill descent control and trailer sway control are fitted for some computer aided support in tricky situations and the brake emergency display should give those behind ample warning if you’ve had to stomp on the anchors suddenly. 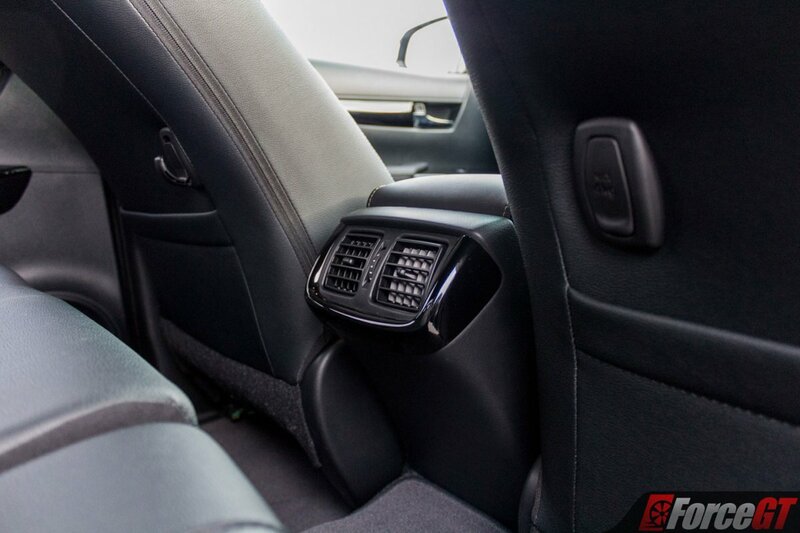 Two 12V sockets are located up front for all your powered car accessory needs and a 220V plug tucked away in the centre console for everything else. 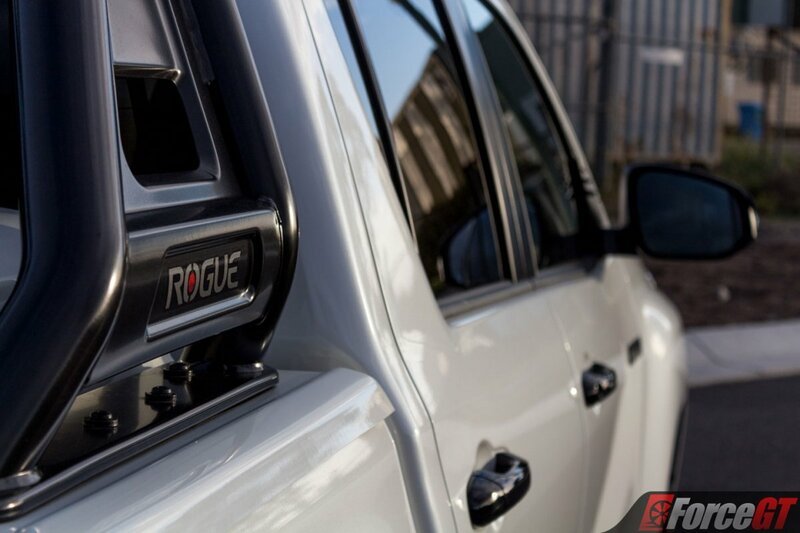 For convenience the Hilux Rogue has you covered with key-less entry and start, cruise control, climate control and auto headlights while the alarm provides you piece of mind when its parked out of sight. 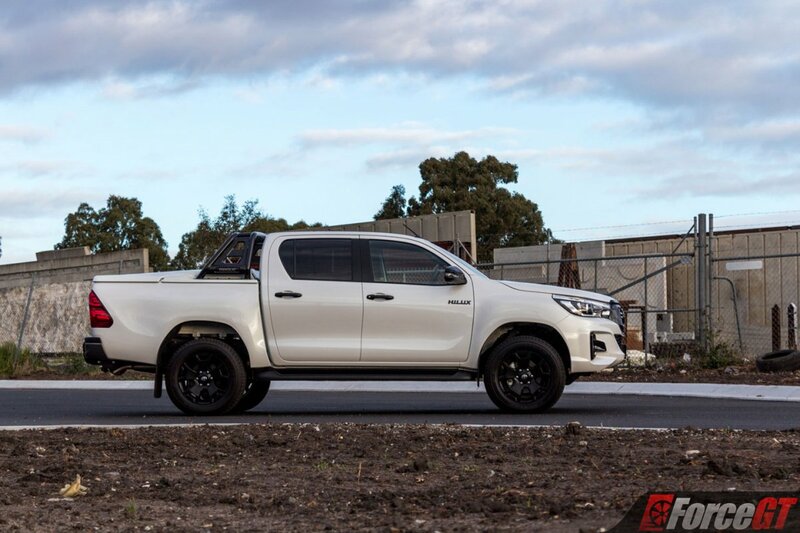 The Hilux Rogue takes the previous top-spec SR5 and extends it further for those who desire additional refinement and capability from their dual cab 4×4 ute right from the factory. Whether it’s being used on the job site or the weekend the Hilux Rogue is spec’ed up to tackle both without compromise making it a great fit for the modern Australian family. 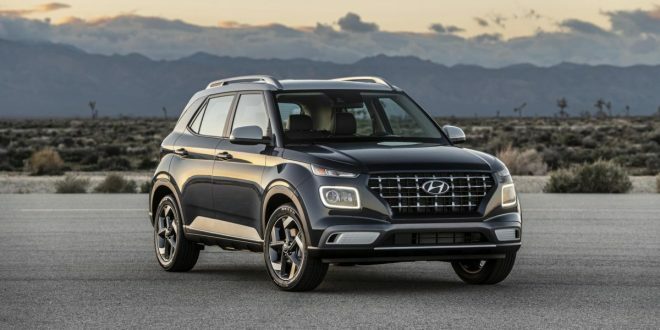 Safety: 5-star ANCAP, 7 Airbags, Seatbelt Pre-Tensioners/Load Limiters (front), Reverse Camera, Emergency Stop Signal Function, Hill Holder, Cruise Control, Hill Descent Control, Trailor Sway Control, Anti-Lock Braking System, Brake Assist, Traction Control, Stability Control, Electronic Brake Force Distribution.